Our Curriculum: Our social skills curriculum is a program called Social Thinking by Michelle Garcia Winner. 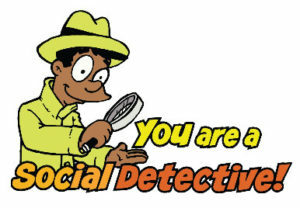 This program encourages participants to be social detectives. Many of our clients require training beyond basic fact-based instruction. To have “good” social skills you must be able to “share space effectively” (Winner, 2005). This includes not only making friends but also standing in an elevator or ordering lunch. Competent social thinkers can enter an area, define who their audience is and change their behavior accordingly. Group Assignment: Our groups are divided somewhat by age but mostly by functioning. Some participants may be ready to understand perspective taking and theory of mind, and others may require more fundamental training. Our director can help find the best match for all. Feel free to share your input and concerns at any time for the best fit. Group Size: Small group size is important to us. When your are acting as a social thinker, you need to be aware, to some degree, of everyone one in a room. That’s why most of us don’t shout “I’m hungry” in a cafeteria! When our groups meet, we encourage participants to think about everyone in the room, which can be overwhelming in a large group. We try to keep our younger groups around four or less participants and larger groups up to eight. Groups of eight can be divided into two when needed.